Sunday, July 23 …Today the leader of BUWEA, Regina, took us to her home. There are so many memories of being on that porch with her husband Sebastian, Sr. Dot, Patricia Lieveld, and so many other WGC volunteers. We also had a wonderful lunch at Rachel’s home. Her children Elizabeth and Gary joined us. It was a great time to visit, share memories, and so many stories of empowerment in families and the community. The reality of packing and the long journey has hit us. We must say goodbye to our collaborators and friends for now but we are always together in our hearts (and online)! Next, we look forward to Regina and her daughter Selva joining us in San Antonio for the OCTOBER 12 WGC Gala – Women in the Changing World of Work. We hope many, many WGC friends and supporters will join us for that important event and the words these ladies will share with us. 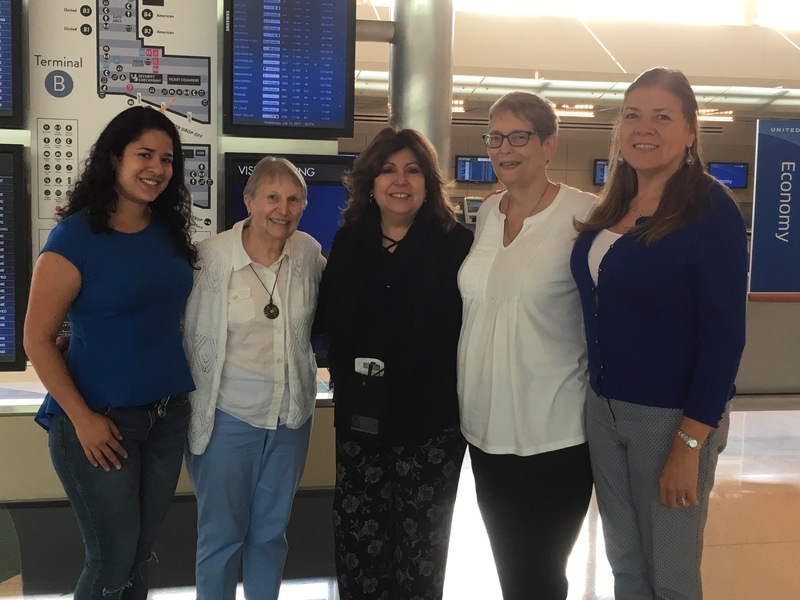 Afterword: Tere (San Antonio) and Faith (New York) both arrived safely home Tuesday night, July 25. Tere will be sharing more from their trip with all of us this fall. Saturday morning (22nd) began with a trip to the BUWEA soy farm. Soy was harvested during May and June but the women never waste time nor space. They are planting cassava, corn, pumpkins and spinach. Faith and Tere had a great time watching a demonstration on how to remove cassava from the ground. We worked in the office before going to the Bookstore to buy items for the WGC Gala. There was no time for lunch as we went directly into leading our Opportunity for Women workshop held at our hotel. 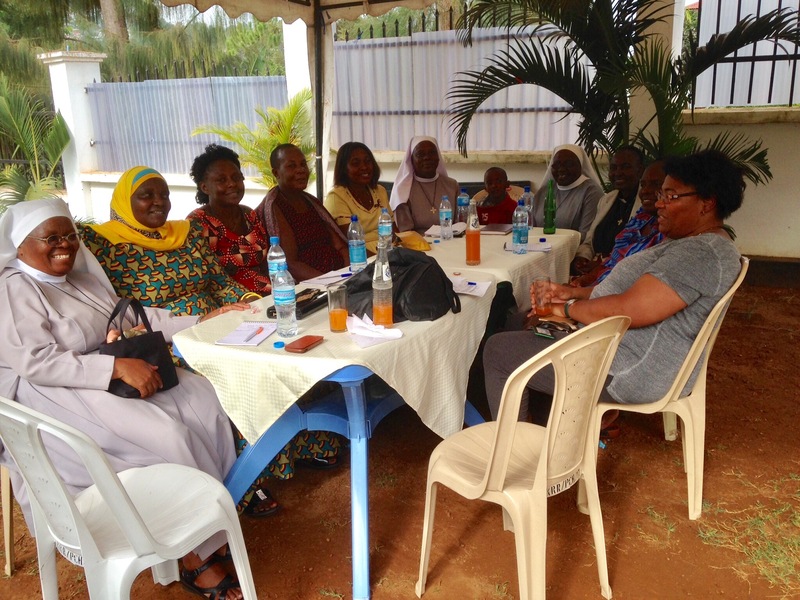 This is a relatively new group of women, relatives of the Hekima students, seeking to become more empowered and to help empower other women. Twenty-six members came to learn basic business skills and relationship management. Many of them had not been to a structured learning opportunity in years. The women said they appreciated the examples and local knowledge we possess as a result of our regular visits. WGC is encouraged to keep collaborating with them. The evening culminated with our traditional dinner at the beach with our BUWEA leaders. Also today we received great feedback from the workshops with the children and their teachers from the Childcare Center. 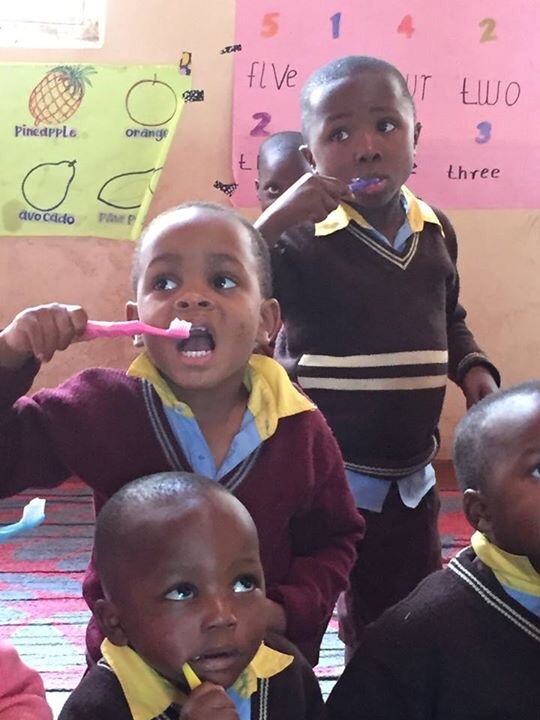 Some went home to ask to have their own toothbrush and told their parents they needed to brush after every meal. Another one was telling his sister he had his very own toothbrush now. Things that may seem small to us are often much bigger, even transformational here. Twenty women showed up for the training sessions on Beginning Crochet. Faith brought colorful yarns and crochet hooks for every participant. She showed them basic loops and single and double crochet stiches. Many of the women are experienced basket weavers. So, with very little guidance they could catch on and crochet while visiting and laughing. Jesca and Tere worked on several administrative tasks to fulfill requirements for grants. They took a break to show the crochet class some of the handcrafts of Pushaq Warmi, our WGC collaborators in Chimbote, Peru. The women admired the work of their fellow sisters across the continent. They particularly liked the Christmas cards and ornaments. After a wonderful lunch we went to the local coffee factory to buy gifts. It was another great day! Our arrival at the Katoke village was greeted by the sounds of drumming and songs. The women danced and welcomed us to the Business Entrepreneurship class. This village has recently joined BUWEA. Most of the women had not attended any formal training session since primary school. Some walked from fishing villages that were as far away as 10 kilometers from the learning center. Many women, including some with their babies, took the path of walking rather than using local transportation to enjoy the sights and sounds of vehicles in the city. Away from their isolated homes they had a chance to dress up and travel for a festive occasion. We reviewed the 4Ps of business: product, price, place and promotion, a SWOT analysis and completed a Stop, Start and Continue exercise. There was much participation and exchange of information to prepare the SWOT analysis. The sound of a pin dropping could be heard in a room that held 51 village women. Every woman received a WGC certificate. It will be proudly displayed in their homes to show their family and friends that they received training because of their BUWEA membership. Regina encouraged them to share what they learned with their husbands and relatives to spread the word and obtain support. While the women were visiting after lunch, our BUWEA friends were helping us get WIFI access. Time and space are not wasted here, as then 15 of us squeezed into the minivan. Nine women joined us to get transportation for five miles. The women shared funny stories about difficult situations during the earthquake such as a bride and groom at their wedding running in different directions; a funeral at the cemetery left unattended for a day and other stories. Despite the pain of losing their property and valuables, the women find humor and support in each other to get through difficult times. Last Tuesday, we went to Hekima Secondary School to begin our three workshop sessions in the library built by SHARE. Fifteen teachers including Sr. Vestina and Sr. Prima attended Managing Conflict, Games in Learning, and the Bloom’s Taxonomy classes to enhance their professional teaching and relationships skills. Afterwards, we surveyed the damage inflicted by the earthquake. We visited the dining hall, the classrooms, and the administrative office where we signed the guest book. It was painful to see the cracked floors, walls and ceilings in dire need of repair. Yet, the love and pride were evident everywhere through the polite welcoming smiles of the Hekima students and their determined teachers. We walked to the new construction site for dorms, and to the guest house and sisters’ residence. The scenery was breathtaking. There were flowers, vegetables and trees along the pathway. At the end of the day, we walked two miles to the main road to get our taxi cab. The road was closed due to scheduled repairs. We were elated to see our driver waiting for us in the dark! On Monday morning July 17, we held the traditional candle blessing ceremony with our BUWEA friends followed by a heartfelt ceremony for Dr. Patricia Lieveld. Faith Myers, Patricia’s sister and immersion trip volunteer, led the procession accompanied by nineteen BUWEA women. She fulfilled her promise to her beloved sister to place her ashes next to a rainwater harvester. The rainwater harvester site and memorial were built at the BUWEA soy plant to honor Dr. Patricia’s memory. Known here as Mama Maji (Mama Water), Patricia taught at the University of the Incarnate Word, one of WGC’s key partners. She traveled with WGC to Bukoba multiple times and worked tirelessly to partner with BUWEA on solutions for the water access and sanitation issues. She gave her funds, her guidance and much inspiration to the project, now named the Lieveld Rainwater Harvester Project. After the women learned how to build the rainwater harvesters, they built the first one in 2012. There are now over 35 of them in various village locations, each with its own neighborhood BUWEA member manager. Patricia’s wonderful legacy will live on with many families and communities. We also held the first training session in business entrepreneurship at the Soy Processing Plant. It was attended by 19 members who have obtained micro-loans through the SACCOS account to start a small business. The women discussed the importance of quality, presentation, and consistency, keeping in mind that we do not need invent something out of the ordinary to start our own business. BUWEA asked for more recipes using bananas so Faith and Tere developed some and demonstrated in workshops using local ingredients. They also cooked an alphabet soup for the children at the Childcare Center and showed all of them how to brush their teeth properly. Later the same day they visited women’s businesses in Ithawa village. They also stopped at the milling station which continues to serve the needs of the community, has spawned other businesses and employs the same two people who started when the station opened. Regina and Juma picked Faith and Tere up at the Kyanyl Resort and Rest House on Sunday morning. Our goal was to go to the Bukoba market to buy ingredients for the cooking class to be held at the BUWEA Bakery. We are also planning to cook alphabet soup for the children of the childcare center on Friday. It will be a fun way to learn letters while enjoying a delicious meal. The market is a busy hub in the center of the city where we can find colorful fabrics and just about every ingredient needed to make our recipes. Regina is helping us select prime bananas for the cooking class. The price of bananas went up after last year’s drought. Bukoba’s population continues to grow and expand despite the devastating earthquake of September 9, 2016. The effects of the earthquake are evident everywhere, cracks in most buildings, construction materials everywhere and sites under reconstruction. Progress is slow but it’s happening. Faith and Tere also had fun on Sunday preparing colored rice for the Sensory Tub exercise for the children of the Childcare Center. The Center was built by the BUWEA leaders to offer much needed child care services to their members and members of the community. It is one of the few childcare centers in the region. Child rearing responsibility is beginning to change as people move away from family members, and older siblings attend school. There are 35 children in the center, which is the maximum. The Sensory Tub is an activity that stimulates the young child’s senses: touch, smell, taste, sight and sound. It facilitates exploration while playing, creating and investigating. WGC prepared this exercise to help young children learn with all their senses, develop fine-motor muscles, language, improve focus and concentration and experience play based learning. The children’s first reaction to the sensory tub was cautious. Initially, the teacher had to guide a little boy’s hand into the tub to begin exploration. They cautiously sorted through the tub while answering questions related to the exercise. Their teacher graciously translated the lesson. Once they figured out the sensory tub, the children used every sense, motor-skill and emotion to enjoy the fun experience. The team reports all is well in Bukoba. 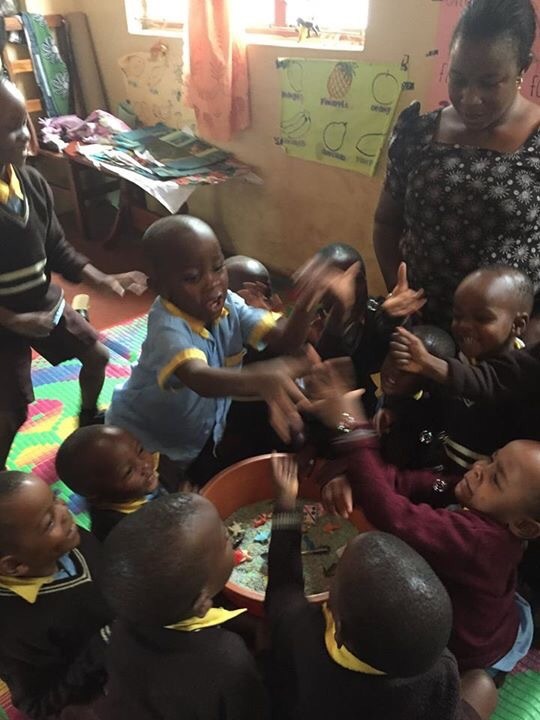 They have conducted a business workshop and demonstrated early childhood activities at the BUWEA Child Care Center which were a big hit! They are planning a day of workshops for the Hekima Opportunity for Women group, an empowerment group of moms of Hekima Girls School students. (See photo). Today was a special ceremony in remembrance of Dr. Pat Lieveld who helped BUWEA begin the very successful rainwater harvester program.